By John C. Toman. Posted September 16, 2012, 11:44 AM. In a reversal of fortunes that sometimes occurs this time of year, Southern California's coastal areas got a record blast of triple-digit temperatures this weekend. Among the areas recording record temperatures in Southern California yesterday were (according to National Weather Service records): Chula Vista (100°F), El Cajon (103°F), Laguna Beach (97°F), Oceanside (86°F), Ramona (101°F), San Diego (101°F), and Vista (105°F). Triple digit temperatures extended well into the Los Angeles basin. No areas in Riverside or San Bernardino counties made the list. On Saturday, in the WeatherCurrents network, now encompassing 19 stations with the addition of Anza, Riverside's Canyon Crest station had the highest reading at 109°F. Other communities above 100°F were De Luz, Fallbrook, French Valley, Jurupa Valley, Lake Elsinore, Menifee, Moreno Valley, Perris, Riverside's Presidential Park, San Bernardino, San Diego's City Heights, Simi Valley, Temecula and Wildomar. San Diego's City Heights weather station, placed in February of this year, recorded its first two triple digit days Friday and Saturday. Fallbrook also had it's first two of the year. The forecast for the next week did not include record heat returning. Temperatures were predicted be cooler but above normal for the first half of the week, then begin to warm for the second half of the week. Clouds from Tropical Storm Kristi, currently off Baja California, are expected in the area Tuesday and Wednesday, but little impact is predicted. More low pressure next weekend should lead to another decline in temperatures for the start of fall. The autumnal equinox is Saturday morning at 7:49am. 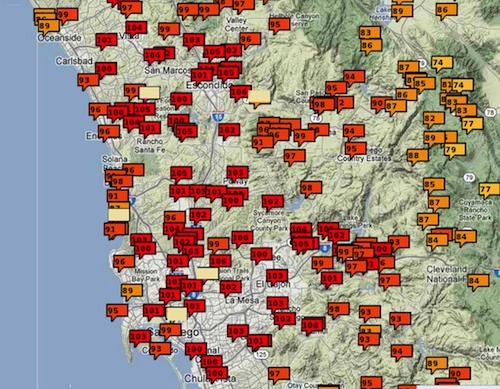 Record temperatures in San Diego. Courtesy of National Weather Service.